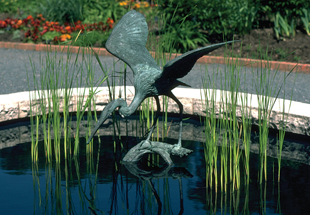 If you are interested in supporting the Garden's sculpture program, please contact the Development Department at (847) 835-8374. The moment depicted by nature artists William and David Turner is a familiar one. 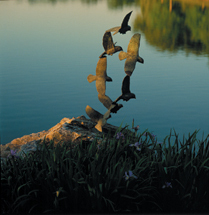 Each bird’s pose is seen daily at sunset as flocks of geese settle in for the evening on the lakes. Caricia is the Spanish word for caress. This name may refer to the smooth surface or to the figurative aspect of the shape. The sculpture also calls to mind the mysterious Easter Island statues or the simplified forms of the artist Jean Arp. 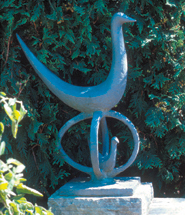 The sculpture is placed as a sentinel along the path outside the Bulb Garden. Together, the curving pathway and the surrounding shrubs at first conceal, but then reveal, the sculpture as visitors approach. 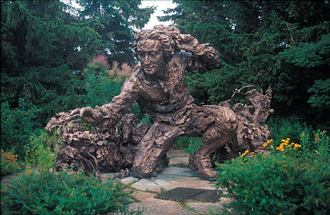 This figure of Swedish physician Linnaeus (1707-1778) looms large in the history of science and is appropriately placed in the Heritage Garden. Linnaeus established binomial nomenclature, the international system of naming plants and animals that is still in use today. Located in the midst of the All-America Rose Selections, this sculpture reflects brilliant flashes of red, yellow, pink and white roses from springtime until late autumn. During the winter, its curving, polished surface mirrors a setting of white snow, blue sky and brown earth. The shape of the work brings to mind the exuberance of plant breeders who develop the award-winning roses showcased here. 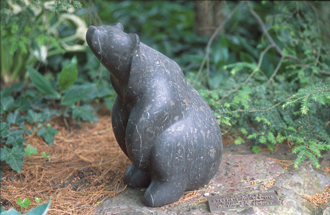 It establishes a central focus, inviting visitors to enter the garden and look closely. The Guardian stands as a folly at the entrance to the English Walled Garden. It is located on the axis that links the North Lake with the Great Basin. Constructed of semiprecious stones and minerals, the sculpture represents the ancient elements of earth, air, fire and water. 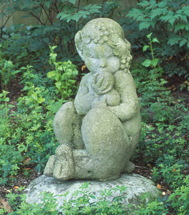 Simon Verity carved stone statuary for the Portal of Paradise on St. John the Divine Cathedral in New York from 1988 to 1997. His work appears in many English gardens, including that of the Prince of Wales. A familiar figure of myth and fairy tale, she is intently trying to pry open the oyster shell she is holding, perhaps hoping to find a pearl inside. Mrs. Judson's own daughter, Alice, posed for this imaginative work when she was just three years old. A mischievous creature of ancient Greek mythology, a faun is half boy, half goat. Grape leaves and clusters of grapes adorn his head as he glances around furtively to see if anyone saw him stealing the oranges he is clutching. Placed on a pedestal at the center of the Fruit and Vegetable Garden, this witty sculpture elevates a popular American icon to high art. Pumpkin is trompe l’oeil art—an object rendered to mimic what it is not. 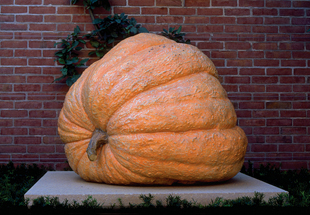 While it appears real, even larger than life, the sculpture was actually cast in bronze by the artist from a champion pumpkin purchased from the 1998 Lake County Pumpkin Weigh-Off. A gift from friends of Mr. and Mrs. Ralph A. Bard, Jr. 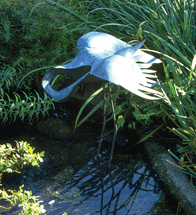 Sounding Sculpture makes us aware of the contribution that gentle sound makes to a garden setting. 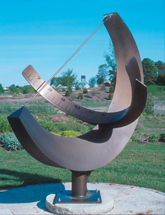 Placed between the Rose Garden and the Linden Allée, the sculpture’s slender rodsof bronze create musical sounds when activated by the wind. Their subtle vibrations suggest wheat fields swaying in the breeze or the melodious harps of antiquity. 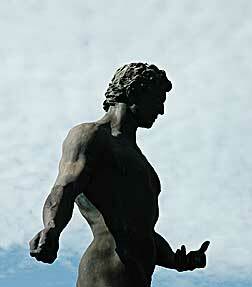 At seven feet tall, this classic male figure captivates the viewer with its height, strong gaze and form. 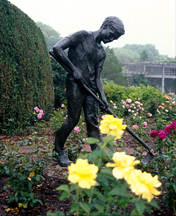 The Sower celebrates the Garden's historic relationship with the Art Institute while acknowledging the Garden's dedication to spreading the seeds of learning about plants and the natural world. This pair of benches—one stainless steel, the other pink granite—can be enjoyed both visually as sculptures and as inviting places to rest. 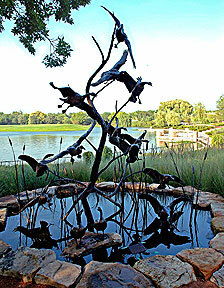 From this site, visitors can view an extended panorama from the Japanese Garden to Evening Island to the Great Basin. 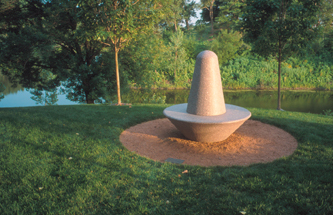 The conical shape has intrigued sculptor Martin Puryear throughout his career. Suggestive of a yurt, the temporary shelter used by the semi-nomadic people the artist observed in central Asia, it brings to mind the notion of impermanence. By creating his cone-shaped sculptures out of durable materials such as stone and steel, Puryear sets up a lively dialogue between the inevitability of change and the dream of permanence.